Sarah Nickerson is like any other career-driven supermom in Welmont, the affluent Boston suburb where she leads a hectic but charmed life with her husband Bob, faithful nanny, and three children—Lucy, Charlie, and nine-month-old Linus. Between recruiting the best and brightest minds as the vice president of human resources at Berkley Consulting; shuttling the kids to soccer, day care, and piano lessons; convincing her son’s teacher that he may not, in fact, have ADD; and making it home in time for dinner, it’s a wonder this over-scheduled, over-achieving Harvard graduate has time to breathe. This book was amazing and changed my entire perspective on my current situation living with chronic pain. It reminded me that it could always be worse. The main character, Sarah, is an extremely busy woman. The book starts out with her getting her kids up in the morning and ready for the day. Talk about chaos! This woman is the queen of multi-tasking doing a million things at the same time. Then she heads to her extremely stressful job as a powerful executive for a Boston consulting firm. This lady doesn’t even have time to eat lunch and can type and email AND talk on the phone. That’s one talent I have not been able to master yet! Sarah’s world as she knows is changed forever that fateful day she is heading to work on the Mass Pike and looks away to use her cell phone. She crashes her car and is left with a brain injury. When she awakens, she is confused wondering what happens and like a dedicated career woman that she is, worries about the work she missed. She is diagnosed with a brain injury called Left Neglect where she is basically unaware of the left side of everything. This includes the left side of the room, the page of a book, and even the left side of her own body. She doesn’t even realize it though as her brain compensates so she thinks she is seeing the whole picture while in reality half is missing. 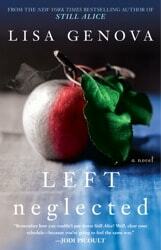 I had never heard of Left Neglect until I read this book and I have to say it sounds really scary. To not be able to read or use my left hand to type or even to see the left side of my screen makes me shudder. Even when she puts makeup on she only puts it on the right side of her face. Sarah is told by doctors that she has a long road ahead and she may never fully recover. I love her fighting spirit and optimism and she was bound and determined she would recover and get her life back. Sarah’s mom comes to stay with her and is with her constantly in the hospital. She helps her with her treatments, going to the bathroom and doing those little things that we all take for granted. My heart ached to read how this strong independent woman struggled asking for help with things that I never think twice about like brushing my teeth or putting on a bra. It really opened my eyes and made me look at my life differently. When Sarah is released from the hospital after her insurance deemed her “recovered”, I couldn’t believe it. She was not nearly back to functioning and still required help for everything. She couldn’t be left alone in the house or take care of her children. There was one part where she was thirsty and was trying to get a coke out of the fridge and wasn’t able to. She tried everything and even sticking her head in the fridge and grabbing it with her mouth. I couldn’t even imagine what her life was like. It sounded like everything she did was a big challenge. When Sarah said she was ready to go back to work and actually went in for the interview to talk to her bosses, I knew there was no way she would ever be able to go back at the same level as before. She was trying to appear like she was better, but really she was trying to mask that she was falling apart. Her old fast paced way of life was gone. The book touched me very deeply and made me cry. It was beautifully written and I felt very connected to both Sarah and her mom. I would probably even read this a second time because I liked it that much. Highly recommended!